If you want to insult God, tell Him you’re bored. It’s one of the greatest insults we can give God. You know? And we hear people say it all the time, “I’m bored.” Maybe it’s a kid or maybe it’s a teenager. But in our hyper-stimulated, hyper-entertained culture it seems to be that even adults are bored more and more. When you think about the idea that God has given you life and this incredible planet and everything and everyone and every possibility and every opportunity that existing in every single moment of every single day, the idea that someone could be bored is a an insult of staggering proportions. Has the Mass become irrelevant to modern people’s lives? I don’t think that’s the problem. I think a lot of modern lives have become irrelevant to the Mass. I think that they are two worlds sometimes colliding. You have the world of the Mass which is the world of God. Which is stimulated and perpetuated by God’s world view.And then you have the life of modern man, which is obviously clashing with that in some way for people to think it’s irrelevant. The problem is not that the Mass has become irrelevant. The problem is not that the Mass has all of a sudden become boring to more and more people. I think the problem is that our lives have become irrelevant. Our lives have become irrelevant to God’s worldview. Our lives have become boring in the modern context because we’ve lost whatever it is that makes them unique. We’ve lost whatever it is that makes them handmade. We’ve lost this great yearning, this great chasing for the best-versions-of-ourselves. And I think a lot of our lives can fall into the trap of being generic, being mass manufactured. And so the Mass remains this great call to Sabbath, this great call to step back, this great call to reflect, this great call to think more deeply about our lives than our culture will naturally challenge us to think. And I think that if we find the Mass boring, if we find the Mass irrelevant, that should be a sign of alarm bells. We go to church on Sunday, it is impossible to be bored, impossible to be bored, if we go to church to listen to the voice of God in our lives. I think very often we go to church and that’s not our goal. Very often we go to church and we don’t want God’s input in our lives. And I can imagine if you’re going to church on Sundays and you’re not interested in doing the will of God, and you’re not interested in listening to God, and you’re not interested in changing your life how God would like and invite you to change your life, I can image that would become boring. Maybe even worse than boring, maybe even annoying. When I disengage, when I’m a little more disengaged at Mass, I’m probably resisting God in something. In something, in someway, somehow in my life I’m probably resisting God. And when I’m resisting God in something, guess what? Yes, I disengage a little bit at Mass. Yes, I get lazy in my prayer. Yes, I get lazy in my spiritual reading. Yes, I tend to focus on myself more and become more self-interested and more selfish. And I become unhappier because when we resist God, we resist happiness. 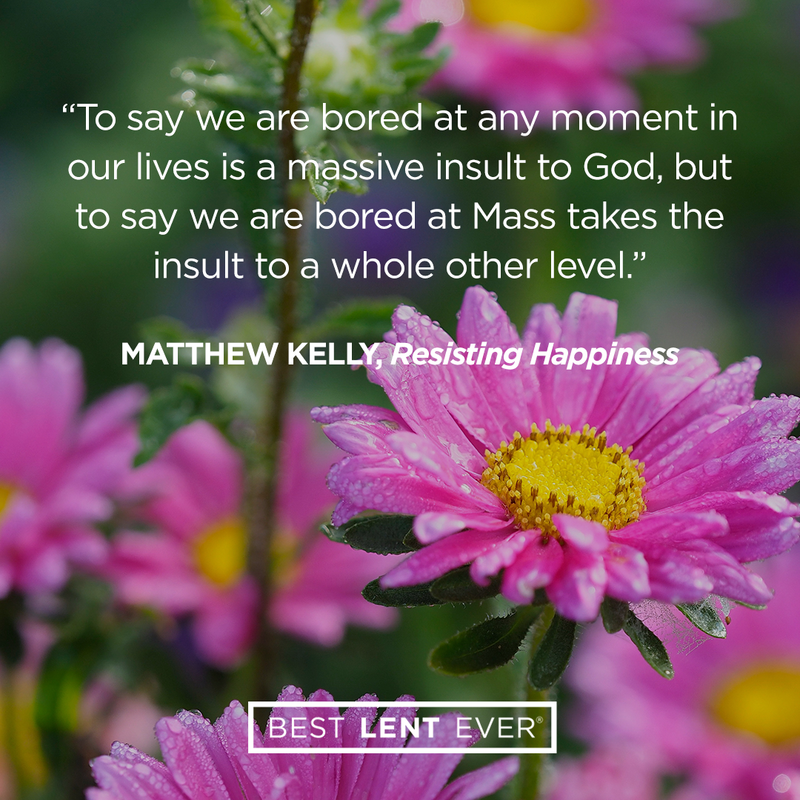 To say we are bored at any moment of our lives is a massive insult to God. If you are ever bored, look for a way to get outside yourself and serve others. Lord, open my heart when I go to Mass this week. Help me to discover your recipe for happiness and peace in the Mass. Today’s personal reflection features Dynamic Catholic team member Luke Kozak. Luke is our IT network engineer. He comes to us from Manhattan, Illinois. Luke served as a lector at Mass at St. Peter’s Cathedral in Rome, has four younger sisters, and led a trip of 80 people to Prague. What is your favorite thing about the Mass?